I absolutely love the vibrant red and purple together and I think this technique is really cool. It results in a riot of colour that is absolutely amazing! But (surprise!) I wanted my riot to be a little more 'controlled'. I think that you really can use any technique and still make a clean-feeling card. I don't really know how Vicki did this with her reinkers (actually, now I hear it was alcohol inks - come on Vicki, do a video! ), so I used my Copics. I cut the Memory Box butterfly out of the white panel and popped out all the little bits. I then lifted the wings (this die is still 'stuck' in the centre - it doesn't cut all the way out) and drew the outline on the card base so I would know where to put my coloured dots. I added Stickles to the wings for sparkle and laid the (separately cut) black butterfly body on. The sentiment is from Annabelle Stamps. I hope you'll get a chance to play along with us this week - the deadline for this challenge is Monday at 8 am EDT. At that time, you can vote for your top 3 favourite cards until Tuesday at 8 am (even if you didn't link up a card). Results will be posted on Tuesday at noon. Wow! Such a stunning effect Ardyth. Gorgeous! The wing colors are brilliant. And I totally love the sentiment - it's so big and beautiful. ;) - You ROCKED IT! This is the perfect take on Vicky's card! Absolutely love it! WOW!! This is absolutely STUN-NING Ardyth!! Wow is right! Love your beautiful card! And the one that inspired it! So fun! Gorgeous! Love this on the white background and also love the size of your sentiment! Beautiful! Your CAS creations are so inspiring! What a gorgeous take on the Muse card. I love how you CASified the design but still used the same technique. Wow! I think this is the most awesome of all your awesome cards, Ardyth! I agree, Vicki needs to give us a tutorial! Ardyth, this is soooo gorgeous. I too wondered how Vicki did her background. I liked what I did, but it certainly was not what sir did. lol. 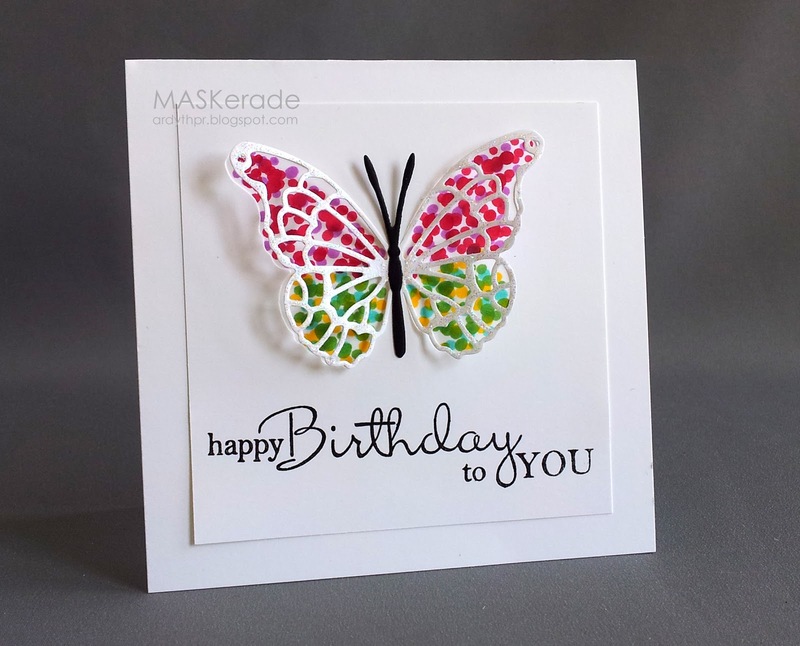 I have that butterfly die, so I am going to try it with colics and CASE your gorgeous card. Thank you for your kind comment on my blog. Have a beautiful day.